Buy 18kt Lemon-Gold-Leaf for Sale here. 18kt Lemon Gold Leaf available in Surface/Loose and Patent/attached to paper Sold 1 book (25 leaves) or by the Pack (20 Books =500 leaves). Rolled 18kt Lemon Gold Leaf available in 67 feet long rolls from 1/4 inch to 4 inches wide. in different widths. This is where to buy gold leaf. fast shipping direct. Lemon Gold Leaf contains a high amount of Silver too obtain it light color. 18kt Lemon Gold Leaf is superior to pure Silver due to the Gold content, Gold is less likely to tarnish as fast as Silver does. Another advantage 18kt Lemon Gold Leaf has over Silver is that it's also easier to Burnish because Gold is softer than Silver and this is why professional gilders 18kt Lemon Gold Leaf over pure Silver. 18kt Lemon Gold Leaf has a little more Gold than 16kt and appears deeper or more of a yellow tone but still looks Lemon to the average eye unless setting side by side.18kt Lemon Gold Leaf is the first in the lower karats to take on a full gold look unless next to a purer Gold. Use 18kt Lemon Gold Leaf for a budget alternative or use it because it's in the middle of color rage between Silver and pure Gold. 18kt Lemon-Gold-Leaf-Rolled Gold Leaf 67 feet. 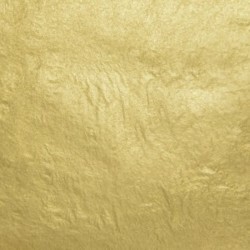 18kt Lemon Gold Leaf Loose-BookBuy 18kt Lemon Gold Leaf Loose-Book of 25 Sheets of Gold Leaf, Size - 3-3/8" x 3-3/8", Surface/Loose Leaf, Min. 16 Gram..
18kt Lemon Gold Leaf Loose-PackBuy 18kt Lemon Gold Leaf Loose-Pack of 20 Books (500 Sheets), Size - 3-3/8" x 3-3/8", Surface/Loose Leaf, Min. 16 Gram ..
18kt Lemon Gold Leaf Patent-BookBuy18kt Lemon Gold Leaf Patent-Book of 25 Sheets of Gold Leaf, Size - 3-3/8" x 3-3/8", Patent Leaf, Min. 16 Gram Weigh..
18kt Lemon Gold Leaf Patent-PackBuy 18kt Lemon Gold Leaf Patent-Pack of 20 Books (500 Sheets), Size - 3-3/8" x 3-3/8", Patent Leaf, Min. 16 Gram Weigh..
Gelatin Size for Water Gilding Gold Leaf by GildersBuy Gelatin Gold Leaf Size for Water Gilding by Gilders for Sale here. Each Package of Gelatin Size..
Gold-Leaf 18kt-Lemon Loose-Book W&B 18kt Lemon Gold Leaf, Book of 25 Sheets of Gold Leaf, size-3-3/8" x 3-3/8", Surface/Loose Leaf..
Gold-Leaf 18kt-Lemon Loose-Pack W&B 18kt Lemon Gold Leaf, Pack of 20 Books (500 Sheets), Size - 3-3/8"3-x3/8", Surface/Loose ..
Gold-Leaf 18kt-Lemon Patent-Book W&B 18kt Lemon Gold Leaf, Book of 25 Sheets of Gold Leaf, Size - 3-3/8"3-x3/8", Patent Leaf, ..
Gold-Leaf 18kt-Lemon Patent-Pack, WB 18kt Lemon Gold Leaf, Pack of 20 Books (500 Sheets), Size - 3-3/8"3-x3/8", Patent Leaf, Min. ..
Manetti 18kt-Lemon Gold-Leaf Patent-Book is 1-book of gold-leaf with contains 25 sheets of Gold-Leaf, size-3-3/8" x 3-3/8", Patent/Transfer-Leaf,..
Manetti 18kt-Lemon Gold-Leaf Patent-Pack of 20-books-gold-leaf contains 500 sheets of Gold-Leaf, size-3-3/8" x 3-3/8", Patent/Transfer-Leaf, 18 G..
Manetti 18kt-Lemon Gold-Leaf Surface-Book is 1-book of gold-leaf with contains 25 sheets of Gold-Leaf, size-3-3/8" x 3-3/8", Patent/Transfer-Leaf..
Manetti 18kt-Lemon Gold-Leaf Surface-Pack of 20-books-gold-leaf contains 500 sheets of Gold-Leaf, size-3-3/8" x 3-3/8", Surface/Loose-Leaf, 18 Gr..
WB 16kt-Pale Gold-Leaf Surface-PackBuy WB 16kt-Pale Gold-Leaf Surface-Pack of 20-books-gold-leaf contains 500 sheets of Gold-Leaf, size-3-3/8" x 3-3/8..
WB 18kt-Lemon-Usual Gold-Leaf Patent-BookBuy WB 18kt-Lemon-Usual Gold-Leaf Patent-Book is 1-book of gold-leaf with contains 25 sheets of Gold-Leaf, si..
WB 18kt-Lemon-Usual Gold-Leaf Patent-PackBuy WB 18kt-Lemon-Usual Gold-Leaf Patent-Pack of 20-books-gold-leaf contains 500 sheets of Gold-Leaf, size-3-..
WB 18kt-Lemon-Usual Gold-Leaf Surface-BookBuy WB 18kt-Lemon-Usual Gold-Leaf Surface-Book of 25 Sheets of Gold Leaf, Size - 3-3/8" x 3-3/8", Surface/Lo..
WB 18kt-Lemon-Usual Gold-Leaf Surface-PackBuy WB 18kt-Lemon-Usual Gold-Leaf Surface-Pack of 20-books-gold-leaf contains 500 sheets of Gold-Leaf, size-..